The Duplication Management Add-in for Excel allows to find, delete and highlight duplicates in Excel spreadsheet ranges and lists. 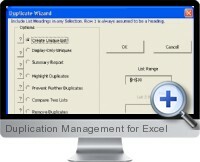 This very handy add-in makes management of lists and duplicate data in Excel simple and efficient. It is designed to assist when there are duplicates in 1 or more lists and/or tables. Create a list of unique data - an option called 'Create Unique List' that creates a fresh copy of your list on a new Worksheet that only contains one occurrence of each entry. Hide all duplicates and Display only unique data - an option called 'Display Only Unique' hides all duplicates in your list showing only one occurrence of each entry. Create a summary report - an option 'Summary Report' takes a list and creates a mini Pivot Table report. This shows at a glance how many times each entry in the list occurs and a total count of one occurrence of each entry. The Pivot table created can then be used to hide/show specified entries in the list. Color code all duplicates, up to 3 levels - an option 'Highlight Duplicates' color codes all entries, appearing more than once, in a list of table of data. If an entry occurs twice it will have a Green background, if it appears three times it will have a Yellow background. Any entry occurring more than three times will have a Red background. The table or list range will also be dynamic in that, if you add more entries and that entry then appears 2, 3 or more times, it will be color coded accordingly. Prevent users from adding duplicates to a list or table - an option 'Prevent Further Duplicates' will prevent the entering of entries that already exists in the table or list. When trying to add an entry that occurs already, a pop-up message is shown indicating that the entry already exists. Compare 2 lists for matching entries - an option 'Compare Two Lists' creates a mini Pivot Table report. This will show a glance how many times each entry in each list occurs and a total count of one occurrence of each entry. The Pivot table created can then be used to hide/show specified entries in the list. Remove duplicates from any range - an option 'Create a list of unique data' removes duplications from a single column list. However, there are times when there are duplications in a range, or table, that consists of more than one column. The option 'Remove Duplicates' will remove duplicates in any specified range. Remove entries from one list that exist in the other - an option 'Compare 2 lists for matching entries' is ideal for showing which items appear in both lists, but does not remove them. The option Remove Entries from 'List Range' that Occur in 'List 2 Range' will accomplish the removal of such duplicates. As it creates a copy, the original 2 lists are left unchanged should they be needed. Remove duplicate rows from a table - an option 'Create Unique Table' will remove all these duplicated rows from a table with duplicated rows and create a copy of your table where all rows are unique. Remove all but first occurrence of duplicates - this option is useful for a table of data where some entries in a particular column have been repeated several times. Repeated entries can be removed leaving only the first occurrence.